Windows maintains a list of the most frequently used programs in the Start menu. These shortcuts enable quick access to the applications. But the long list also tends to be unclear. You can reduce the number of entries in the list. Right-click ‘Start’ for this. Select ‘Properties’ in the following context menu. The ‘Taskbar and Start Menu Properties’ dialog box opens. In case of Windows XP and Vista, ensure that the ‘Start menu’ option is selected. As opposed to that, the ‘Classic Start menu’ option sees to it that Windows displays the Start menu in the layout of older versions, where the list for the most frequently used applications had not yet been integrated. The ‘Customize Start Menu’ dialog box opens on clicking ‘Customize’. It differs depending on the version of the operating system. 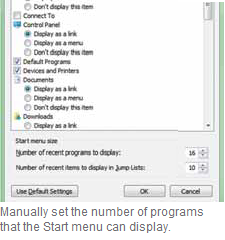 In case of Vista and Windows 7, you must type the number of desired program shortcuts under ‘Number of recent programs to display’. If you use Windows XP, you will find the ‘Number of recent programs to display’ option in the ‘General’ tab. Windows carries out the modifications after confirming with ‘OK’. NOTE: By entering ‘0’, you completely remove the list of the most frequently used programs.